I spent all day Saturday alternating between defrosting the big freezer and reading a book about Alaska. It was a bit surreal --- as I hacked through the rainwater-turned-ice which a leaky gasket had allowed to engulf my food, I felt like I was single-handedly enacting a spring thaw. The problem of our leaky gasket aside, the two free freezers we acquired a couple of years ago have been some of our best farm tools. I was raised on canned farm produce, and I'm here to tell you that frozen farm produce tastes about ten times as good as canned farm produce. It's better for you too. 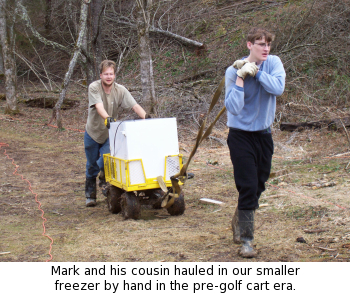 So, in honor of the spring thaw, this week's lunchtime series is an introduction to farm freezing. Stay tuned!